A little while ago I was talking to someone about a piece of textile work (not my own). I made a comment about the stitching. My companion objected - they viewed the stitches simply as drawn marks. In fact, that was what I had meant - I had been admiring the variety of marks achieved and the way they interacted with the marks in the cloth. But I knew why they had challenged my initial remark and this momentary tension set me thinking. When people talk about textiles you often hear a focus on technique at the expense of the work itself. I think many people are more comfortable talking about the materials and the way something is made than the ideas behind it, artistic effects or compositional qualities. This is all too common in the textile world but it isn't absent from the fine art world because I've heard this in exhibitions of paintings, photographs, drawings too - people deconstructing the technical aspects of the work - the way it is made - rather than the work itself. And actually there are some works where I wonder whether I would be so engaged if I did not know how they were done. Brice Marden's graphite drawings for example. So when I commented on the stitches, it sounded as though I was talking about the technique rather than the effect. 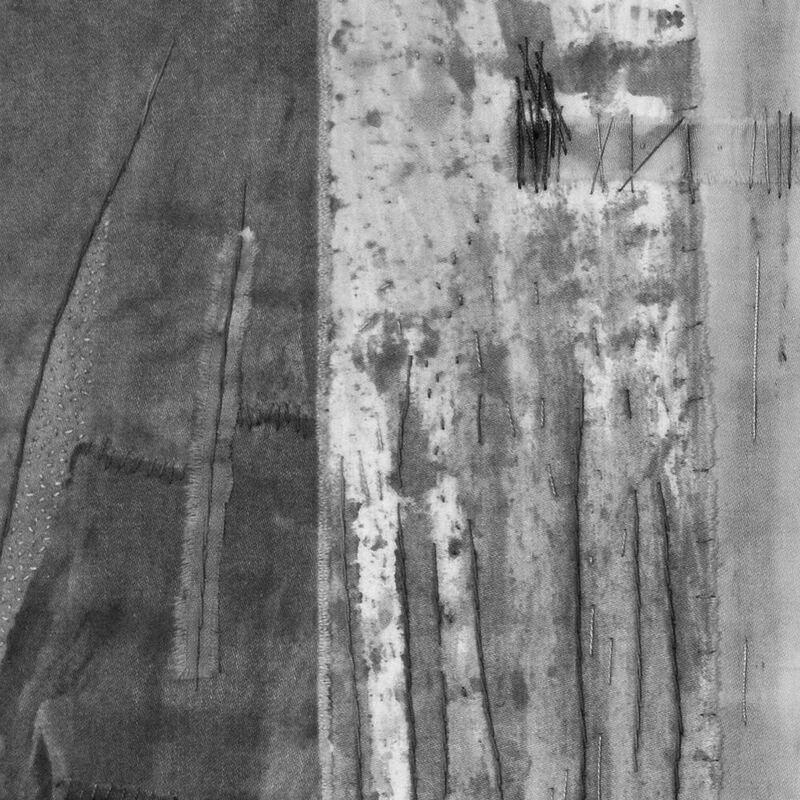 But in the same way as drawn marks have different qualities, so do stitch marks - and some artists exploit this really well. A stitch has a physical dimension that a drawn mark does not. It has a back as well as a front. It can project into space. The ends may be left trailing or standing out. It follows a trail - so that you can deduce what is happening on one side from what you see on the other. It can serve a purpose - linking or holding things together - creating a relationship between itself and the surface. Roanna Wells created a piece titled "Withdrawn" for the 2011 Jerwood Drawing Prize in which the marks on the surface were what was left after she had removed all her stitches. A form of erasure drawing. A kind of ghost image. Beautiful and interesting in itself but the way the drawing had been achieved added a deeper resonance. I am interested in this relationship between image, marks and surface. There are many art works that explore this in really interesting ways. Textiles happen to offer a particularly broad range of ways that artists can do so. I sometimes pause to consider why I work with cloth, dye and stitch rather than other media. The answer in my case is to do with the way the marks - both dyed and stitched - become an integral part of the cloth. They do not just sit on the surface. And the way the cloth itself influences what happens with the dye and the stitch - it is not passive. The images above are all from previous work - in black and white to emphasise the marks. I have several new pieces of work in progress at the moment and they are all approaching the stitch stage. So it's a good time to be thinking about the kind of marks I want to make and how I want them to relate to the cloth.